The effects of ZJXG decoction on the serum CT levels and the expressions of CTR and Cbfα1 in callus of femur fracture rats. Zhuang Jin Xu Gu decoction is a well-known traditional-chinese medicine prescriptionon. The present study investigated the effects of the serum level of calcitonin, the expressions of calcitonin receptor and core binding factor α1 in callus of femur fracture rats. The rats were randomly divided into shamoperated group, model group, control group and treatment group. The rats in the treatment group were gavaged with Zhuang Jin Xu Gu decoction for 28 days whereas those in the other three groups were given an equal amount of normal saline. The serum level of calcitonin was detected by enzyme linked immunobsorbent assay. The fracture healing process was analyzed by X-ray and hematoxtlin-eosin staining. The expressions of calcitonin receptor and core binding factor α1 in callus were evaluated by immunohistochemical staining. Changes in the levels of calcitonin in the serum, calcitonin receptor and core binding factor α1 in callus of the rats were measured. 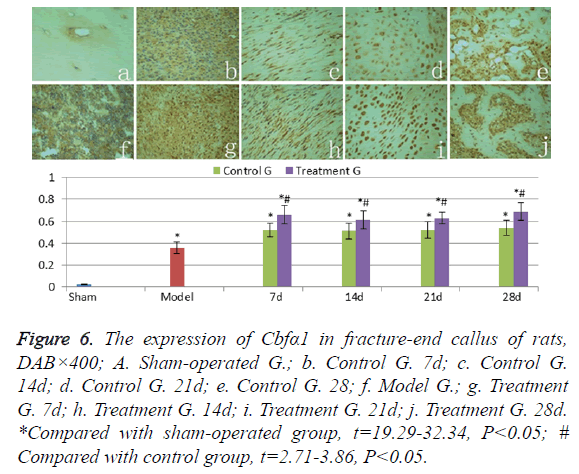 The results of the study showed that Zhuang Jin Xu Gu decoction might promote fracture healing by inhibiting the degradation of calcitonin to remain at a high level and promoting the expression of calcitonin receptor and core binding factor α1 in callus at various stages after fracture. In this experiment, rats were used to fit in for the femur fracture models by breaking the femur at middle point and fixing with a Kirschner needle intramedullary to achieve a relatively stable link between the broken ends of the fracture, when fracture healing will enter a secondary healing mode in which a large amount of bone callus is formatted. Fracture secondary healing is the most common clinical fracture healing mode, which can almost perfectly simulates embryonic bone formation process, including hematoma organization, fibrous callus formation, cartilage callus formation, bony callus formation and callus remodeling . Secondary healing mode process is complex yet orderly, have different kinds of tissue cells and hormones appearing at different stages; the biological active factors plays an important role in the secondary healing mode [2-5]. As a prescription of traditional Chinese medicine, clinical practice shows that ZJXG decoction has the effect of promoting fracture healing . This experiment aimed to elucidate whether the effect of ZJXG decoction in fracture repair was related to the serum levels of Calcitonin (CT), Calcitonin Receptor (CTR) and the levels of core binding factor alpha 1 (Cbfα1) expression in callus, and to investigate its mechanism of enhancing fracture healing. Totally 50 healthy adult male Wistar rats were selected, each weighing 230-250 g. SPF grade was provided by Qingdao Drug Inspection Animal Center (SCXK(LU) 20120010). All animals are adaptive bred 7 days, and then randomly divided into sham-operated group (n=5), model group (n=5), control group (n=20) and treatment group (n=20), which the later two groups were subdivided into 4 subgroups (5 rats each) which were drug administered for 7d, 14d, 21d and 28d,respectively. The experiment was approved by the Ethics Committee of Qingdao University Medical College (QUMC 2011-09). The local legislation regarding the ethics of animal experimentation and the guidelines for the care and use of laboratory animals followed all animal procedures. All animals were anesthetized by injecting 10% chloral hydrate (300 mg/kg) intraperitoneally, and by fixing with prone position and aseptic operation. The animals in the model, control and treatment groups were treated with lateral femoral incision, femur-separated through the thigh anterolateral intermuscular septum and femur-cut in the middle of the femur and then fixed retrogradely with a Kirschner needle intramedullary. At last, skin was sealed and bandaged aseptically. The surgical success rates are 100%. The rats in the sham-operated were subject to the same surgical procedures without cutting the femur. Composition of medical formula: ZJXG Decoction, which is composed of 12 constituents as specified in Table 1, was derived from the ZJXG Pellet recorded in Shang Ke Da Cheng written by Zhao Lian of the Qing Dynasty in ancient China. Table 1. Chinese herbal medicines of ZJXG decoction. Procedure for manufacture: The ZJXG decoction was decocted according to the Standard of Decocting Herbal Medicine promulgated by Chinese Administration Department of Traditional Chinese Medicine. The mixture of all herbal plants were immersed in distilled water for 30 min at 25°C with relative humidity ≤ 85%, and then cooked to the boiling, kept on simmer for 15 min to concentrate the extracts, protecting and maintaining all essential ingredients. The same procedure was repeated for 2 times. The two extractions yielded an amount of 224 mL liquid medicinal decoction containing 112 g of dry weight (concentration of 0.5 g/ml) which was packed with sterilized plastic bags and stored at -20°C. Treatment methods: According to the previous research results, the ideal dose was 1.25 g/kg (2.5 ml/kg) . The rats in the sham-operated group and the control group were given an equal amount of normal saline at the same time. Five rats were selected from each group to be observed in 7, 14, 21, 28 days after treatment. X-ray: X-ray films (GE Revolution RE/d type, USA) of fracture femur were used to observe the processes of fracture healing. ELISA: The rats were anaesthetized by 10% chloral hydrate (300 mg/kg) and 4 ml was collected from the abdominal aorta to centrifuge at 4000 rpm for 10 minutes to separate the serum. ELISA kits (Blue Gene Company) were used to determine the serum levels of CT. Firstly, the serum sample was dissolved at room temperature and centrifuged again, then the absorbance (A) value of supernatant sample 100 μl was measured by a microplate reader (Bio-Rad 550, USA) at 450 nm. The concentration of CT in the corresponding coordinate (ng/L) was calculated according to the A value of the sample. Gross Anatomy: The anesthetized rats were then sacrificed and the femurs were taken out, washed of the remaining blood with normal saline for gross observation. Path-anatomy: After the blood collection, the femur was removed and fixed with 4% paraformaldehyde for 24 h, distilled water soak 4 h, and decalcified with a 20% solution of Ethylenediamine Tetraacetic Acid (EDTA) for 20 d. The tissue of fracture site was cut and dehydrated with ethanol, transparentized by xylene, and finally embedded in paraffin. The sections (thickness 5 μm) were cut along the longitudinal axis of the femur by microtome (Leica2015, Shanghai) and bonded to glass slides, which were stained by Hematoxylin Eeosin (HE) for the observation of the callus structures under the microscope. Immunohistological staining: The rabbit anti-rat primary antibody of CTR (BS-0124R, 1:200) and Cbfα1 (ZLI-9018, 1:200) were provided by Beijing Baosen Bio-Tech Co. Ltd. Paraffin sections prepared as above were dewaxed and washed routinely, operated by the specification of SABC kit (09G22C), developed by DAB chromogenic reagent kit and re-stained by hematoxylin. Under light microscope, cytoplasm that presented yellow granular was considered as positive cell. Negative control slices were dyed with 0.01 mol/L PBS instead of CRT and Cbfα1 primary antibody and no positive reaction appeared. Five non-overlap visual fields were randomly chosen under 400-fold light microscope. The absorbance (A) value was analysed by Quantity One software and finally the mean value was found. The expression intensity of CRT and Cbfα1 was represented by A value of CTR and Cbfα1 =Positive A valuebackground A value. All data were presented by Mean ± SD and analysed using SPSS11.0 statistical software. P<0.05 was considered as significant. The serum levels of CT of the model group rats were higher than those in sham-operated group (t=12.16, P<0.05); the serum levels in the control group and the treatment group rats were significantly higher than those in the sham operation group rats at each time point (t=2.44-19.13, P<0.05). 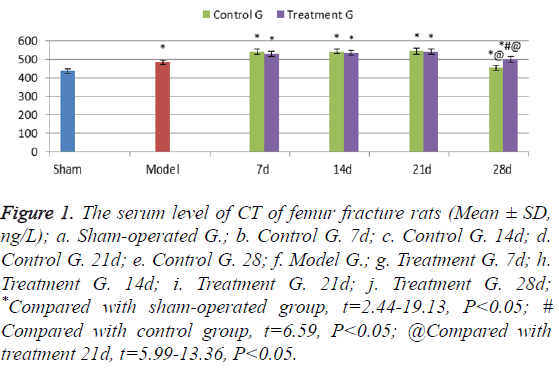 In 7-21 days’ treatment after fracture, the serum levels of CT in the treatment group rats showed no significant difference from those in the control group rats. In 21 days however, the serum levels of CT in control group rats decreased significantly, while levels of CT in treatment group rats were higher, suggesting a significant difference between the two groups (t=6.59, P<0.05) (Figure 1). Figure 1: The serum level of CT of femur fracture rats (Mean ± SD, ng/L); a. Sham-operated G.; b. Control G. 7d; c. Control G. 14d; d. Control G. 21d; e. Control G. 28; f. Model G.; g. Treatment G. 7d; h. Treatment G. 14d; i. Treatment G. 21d; j. Treatment G. 28d; *Compared with sham-operated group, t=2.44-19.13, P<0.05; # Compared with control group, t=6.59, P<0.05; @Compared with treatment 21d, t=5.99-13.36, P<0.05. Sham-operated rats’ femoral bone cortex were complete and continuous, with clear bone marrow cavities (Figure 2a). The model group rats’ fracture line was clear on the first day, with the surrounding soft tissue swelled (Figure 2f). Seven days after bone fracture, fracture line of the rats in control group became more clear (Figure 2b); on the fourteenth day, the fracture line was slightly fuzzy (Figure 2c); on the twenty-first day, calcium salt deposition began (Figure 2d); on twentyeighth day, bone callus formatted (Figure 2e). In 7-21 days after fracture (Figures 2g-2i), callus structure for the treatment group’s rats showed no significant difference from that for the control group’s rats at each time point, but on the twentyeighth day, treatment group (Figure 2j) callus structure turned better than the control group’s (Figure 2e), with the images becoming clearer. 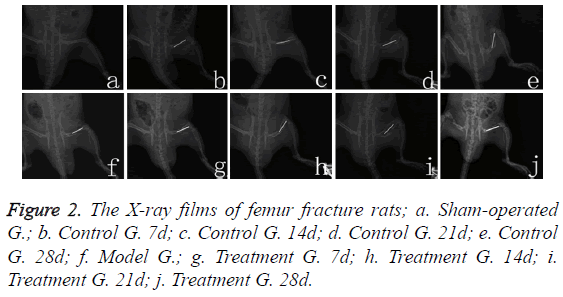 Figure 2: The X-ray films of femur fracture rats; a. Sham-operated G.; b. Control G. 7d; c. Control G. 14d; d. Control G. 21d; e. Control G. 28d; f. Model G.; g. Treatment G. 7d; h. Treatment G. 14d; i. Treatment G. 21d; j. Treatment G. 28d. Cortical bone was complete in Sham-operated group rats (Figure 3a), while the fracture fragments were separately distributed in model group rats (Figure 3f). The broken ends were surrounded by a small amount of soft fibrous granulation tissue in 7 days after fracture (Figure 3b); in 14 days, they were packaged by a large number of pliable fibrous calluses in a spindle shape (Figure 3c). In 21 days, a large number of fibrous calluses was packaged and hardened (Figure 3d). Fibrous callus was then gradually replaced by cartilage and bone callus in 28 days (Figure 3e). There was no statistical difference between treatment group and control group during 7-21 days at the corresponding time point (Figures 3g-3i), but callus calcification in treatment group (Figure 3j) was significantly better than that in control group (Figure 3e). Figure 3: The gross anatomy of femur in fracture rats; A. Shamoperated G.; b. Control G. 7d; c. Control G. 14d; d. Control G. 21d; e. Control G. 28; f. Model G.; g. Treatment G. 7d; h. Treatment G. 14d; i. Treatment G. 21d; j. Treatment G. 28d. Middle femoral cortical bone structure of sham-operated group rats was normal (Figure 4a). The breaking-ends of rats in model group were filled with hematoma and inflammatory cell infiltration (Figure 4f). The control group rats in 7 days after fracture, inflammatory cells infiltrated and granulation tissues occurred between fracture gaps (Figure 4b); In 14 days, fibroblast proliferated and differentiated to fibrous callus, a small amount of Cartilage callus were formatted (Figure 4c); On the twenty-first day, a large number of chondrocyts differentiated into cartilage callus, osteoclasts appeared, and partial cartilage callus started the process of endochondral bone formation (Figure 4d). In 28 days, cartilage cells calcified into irregular bone trabecula (Figure 4e). In 7-21 days, there was no significant different pathological structure between the treatment group rats (Figure 4g-4i) and the control group rats (Figure 4b-4d) at the corresponding time points. But on the twenty-eighth day, the callus tissue of rat trabecular structure (Figure 4j) in treatment group was significantly better than in control group (Figure 4e), whereas the trabecular structure of callus in treatment group (Figure 4j) appeared significantly better than in control group (Figure 4e). Figure 4: The path-anatomy of callus in fracture-end of rats, HE ×400; A. Sham-operated G.; b. Control G. 7d; c. Control G. 14d; d. Control G. 21d; e. Control G. 28; f. Model G.; g. Treatment G. 7d; h. Treatment G. 14d; i. Treatment G. 21d; j. Treatment G. 28d. 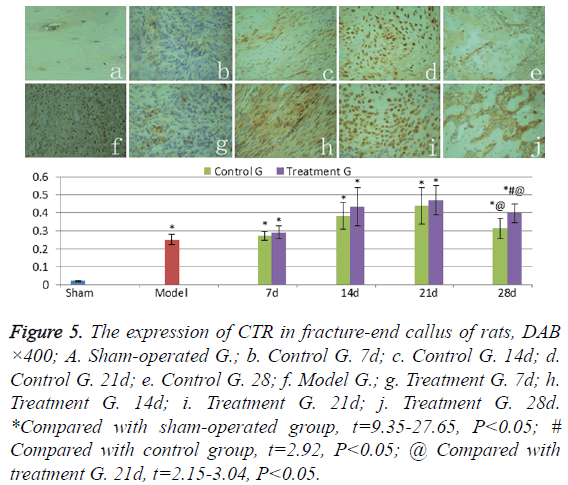 CTR weakly expressed in normal cortical bone of shamoperated group (Figure 5a), the levels of CTR expression in hematoma and granulation of the model group rats (Figure 5f) were significantly higher than those in sham-operated group (t=24.27, P<0.05). CTR levels in callus were found gradually increasing in treatment group and control group in 7-21 days after fracture (Figures 5b-5d and Figures 5g-5i); and significantly decreased from the twenty-first day to the twentyeighth day (Figures 5e and 5j) (t=2.15-3.04, P<0.05). The CTR expression levels of callus in treatment group were higher than those in control group in 7-28 days after fracture, but significant difference was presented only on the twenty-eighth day (t=2.92, P<0.05). Figure 5: The expression of CTR in fracture-end callus of rats, DAB ×400; A. Sham-operated G.; b. Control G. 7d; c. Control G. 14d; d. Control G. 21d; e. Control G. 28; f. Model G.; g. Treatment G. 7d; h. Treatment G. 14d; i. Treatment G. 21d; j. Treatment G. 28d. *Compared with sham-operated group, t=9.35-27.65, P<0.05; # Compared with control group, t=2.92, P<0.05; @ Compared with treatment G. 21d, t=2.15-3.04, P<0.05. Cbfα1 was weakly expressed in normal cortical bone of shamoperated group (Figure 6a). The levels of Cbfα1 expression in hematoma and granulation of the model group rats (Figure 6f) were significantly higher than those in sham-operated group (t=17.67, P<0.05). Cbfα1 levels stayed at a high level in callus of the treatment group and the control group in 7-28 days after fracture (Figures 6b-6e and Figures 6g-6i). And at each time point, there was no significant difference (t=0.32-1.53, P>0.05). The Cbfα1 expression levels in callus of the treatment group were higher than those in control group (t=2.71-3.86, P<0.05) in 28 days. Figure 6: The expression of Cbfα1 in fracture-end callus of rats, DAB×400; A. Sham-operated G.; b. Control G. 7d; c. Control G. 14d; d. Control G. 21d; e. Control G. 28; f. Model G.; g. Treatment G. 7d; h. Treatment G. 14d; i. Treatment G. 21d; j. Treatment G. 28d. *Compared with sham-operated group, t=19.29-32.34, P<0.05; # Compared with control group, t=2.71-3.86, P<0.05. The healing process of fracture relates to histology, biology, endocrinology, biomechanics and other disciplines. A variety of hormones and cytokines play an important role in fracture healing process, such as Parathyroid Hormone (PTH) , Calcitonin (CT)  and core binding factor alpha 1 (Cbfα1) , and so on. CT can be directly applied to OsteoblastOBto promote the differentiation and proliferation of OB . Research shows that CT directly stimulate mouse OB osteosarcoma oncogene (c-fos) , insulin-like growth factor-1 (IGF-1) , osteocalcin (bone gla-protein, BGP) and the mRNA expression of type I collagen, so as to promote the proliferation and differentiation of OB . Zheng et al. held that CT up-regulated gene expression of Cbfα1 through ERK1/2 signaling pathway and promoted the proliferation and differentiation of OB. The proper concentration of CT promotes the proliferation, differentiation and mineralization of OB , by the way of increasing the concentration of Ca2+ in OB to improve the biological activity of OB . CT promotes the proliferation and differentiation of OB, up-regulates Osteoprotegerin (OPG) mRNA expression and inhibits receptor activator for nuclear factor κB ligand (RANKL) mRNA expression, thereby inhibiting OsteoclastOCproliferation and differentiation . CTR is one of the earliest receptors found on OC. CT binding to its receptor (CTR) affects OC and inhibits bone resorption, which has been widely used in the treatment of osteoporosis , hypercalcemia, Paget's disease, etc. . In the process of fracture healing, CT inhibits the re-absorption process of bone callus formation, enhances callus mineralization in a certain extent and reduces systemic metabolic effect caused by local bone injury . The experimental study shows, ZJXG decoction slowed inactivation of CT in serum, prolong its half-life, which to maintain the serum level of CT in the late process of fracture, enhance its activity . In this experiment, the fracture test results of serum CT level in rats showed that in the first 7-21 days after fracture, the treatment of ZJXG decoction in fracture could not promote the synthesis and secretion of CT, but on twenty-eighth day after fracture, ZJXG decoction may function by inhibiting the degradation of serum CT to remain at a high level. Immunohistochemistry results showed that, CTR expression was found increasing in callus from the seventh day to the twenty-first day; on the twenty-eighth day, the expression decreased, suggesting that in 7-21 days after fracture OC gradually increased, and in twenty-eighth day OC reduced. OC promotes cartilage callus absorbed and transformed to the bony callus at a later stage of fracture healing, also promotes the remodeling structure of bone callus. So ZJXG decoction might promote cartilage callus ossification and bone callus remodeling at a later stage of fracture healing. Cbfα1 is a specific transcription factor responsible for mesenchymal stem cells differentiation into osteoblast , and a necessary condition for bone formation during embryonic development. Cbfα1 not only regulates the differentiation of OB, but also the function of differentiated OB and the expression of extracellular matrix proteins, thus affecting the postnatal bone growth and development. Tu et al. found that decreased expression of Cbfα1 will interfere with the healing process of fracture, and local collagen matrix doped with cDNA of Cbfα1 can obviously promote the regeneration and repair of bone tissue. Though Cbfα1 insufficiency doesn’t cause embryonic skeletal development failure, it can damage the postnatal bone formation . Ying et al. , by fixing Cbfα1 to adenovirus for expression on bone marrow mesenchymal stem cells with the method of reactive polymer coating, significantly promoted the differentiation of bone marrow mesenchymal stem cells differentiation into OB. As a transcription factor, Cbfα1 regulates the target gene expression by binding to the specific area of target gene. Ducy et al. found a cis-acting element in the promoter region area of rat Osteocalcin gene 2 (mOG2), which significantly increased that gene’s expression, and was named the osteoblast specific cis acting element (OSE2), subsequent studies confirmed that OSE2 is the Cbfα1 specific binding site. Other than BGP, there are other related bone extracellular matrix proteins, such as Osteopontin (OPN) and bone sialoprotein (BSP); collagen gene type I also contain OSE2 sequence combined with Cbfα1. This extracellular matrix protein for fracture healing is essential. For example, BSP has bidirectional regulation on chondrocytes proliferation and apoptosis in endochondral ossification process . In the process of chondrocyte maturation and growth of bone formation, Cbfα1 also plays an important role. During secondary healing mode process of fracture, composing growth plate cartilage of chondrocytes is a necessary step of endochondral ossification, because Cbfα1 directly regulates a group of special cell-cycle genes, such as Gpr132, Sfn, c-Myb and cyclin A1. These genes regulate the proliferation and differentiation of chondrocytes . Chen et al. found that chondrocyte specific lack of Cbfα1 would cause endochondral ossification failure, impaired craniofacial development, dwarfism and prenatal death in rats. Cbfα1 combines with Oxygen-Dependent Degradation Domain (ODDD), restricts the interaction between von Hippel-Lindau protein (pVHL) and Hypoxia-Inducible Factor-1α (HIF-1), so as to stabilize HIF-1α and to further regulate angiogenesis of hypertrophic cartilage zone of the growth plate during endochondral ossification in time and space . In addition, Cbfα1 promotes bone mineralization . The expression of the Cbfα1 gene transfected adipose-derived stem cells not only induces adipose-derived stem cell differentiation to OB, but also promotes mineral deposition and bone like tissue formation . With the aid of semi-quantitative RTPCR method Wang Li  found that ZJXG decoction significantly promoted the gene expression of Cbfα1 two weeks after the fracture, so as to promote the differentiation of OB and to accelerate fracture healing. This experiment indicated that high-level expression of Cbfα1 in callus 7-28 days after fracture, confirmed Cbfα1 mainly played an important role in the process of osteogenic cells differentiation and maturation. In ZJXG decoction treatment group, Cbfα1 expression levels were significantly higher than those in control group in different periods, indicating that ZJXG decoction can promote the expression of Cbfα1, enhanced Cbfα1 in different period of fracture healing. Our previous study showed that ZJXG decoction can maintain a high level of the basic fibroblast growth factor (bFGF) in rats after fracture . Teplyuk et al. argued that Cbfα1 and FGF/ proteoglycan axis may form an extracellular matrix (ECM)- related regulatory feed-back loop that controls osteoblast proliferation and execution of the osteogenic program. It can be therefore speculated that ZJXG decoction maintained at a higher level of bFGF by the aid of Cbfα1 after fractures, which may be one of the mechanisms of ZJXG decoction promoting fracture healing. ZJXG decoction might promote fracture healing by inhibiting the degradation of CT to remain at a high level and promoting the expression of Cbfα1 in callus at various stages after fracture. It could also promote the endochondral ossification process of Cartilage callus and the remodeling process of osseous callus by regulating the functional status of osteoclast. This experiment was supported by grant-in-aids for the Natural Science Fund of China (81274116, 81041092). The authors thanks YuJinBio Sci. Tech. Co. Ltd. (www.yujinbio.com, Email: [email protected]) to help us edit our manuscript. Frost HM. The biology of fracture healing. An overview forclinicians Part 1. ClinOrthop 1989; 248: 283-293. Dogaki Y, Lee SY, Niikura T, Koga T, Okumachi E. Effects of parathyroid hormone 1-34 on osteogenic and chondrogenic differentiation of human fracture haematoma-derived cells in vitro. J Tissue EngRegen Med 2013; 29: 1-7. Bulbul M, Esenyel CZ, Esenyel M, Ayanoglu S, Bilgic B, Gulmez T. Effects of calcitonin on the biomechanics, histopathology, and radiography of callus formation in rats. J OrthopSci 2008; 13: 136-144. Kawahata H, Kikkawa T, Higashibata Y, Sakuma T, Huening M. Enhanced expression of Runx2/PEBP2αA/CBFA1/AML3 during fracture healing. J OrthopSci 2003; 8:102-108. Martin TJ. Calcitonin, an update. Bone 1999; 24:63s-65s. Huang PJ. Clinical observation of ZhuangjinXugu decoction joint locking compression plate fixation on tibial plateau fractures. Inner Mongolia J Tradit Chin Med 2012; 31:20-21. Farley JR, Wergedal JE, Hall SL, Herring S, Tarbaux NM. Calcitonin has direct effects on 3[H]-thymidine incorporation and alkaline phosphatase activity in human osteoblast-line cells. Calcif Tissue Int 1991; 48:297-301. Kobayashi T, Sugimoto T, Saijoh K, Fukase M, Chihara K. Calcitonin directly acts on mouse osteoblastic MC3T3-E1 cells to stimulate mRNA expression of c-fos, insulin -like growth factor-I and osteoblastic phenotypes (type I collagen and osteocalcin). BiochemBiophys Res Commun 1994; 199:876 -880. Zheng PF, Dong Z, Wang JG, Lou Y. Thyrocalcitonin regulates the cbfa1mRNA expression of osteoblasts via signal pathway of ERK-MAPK. J Clin Med Practice 2009; 13:35-38. Zhao JS, Zhang XZ, Han JF, He M, Lei T. Vitro study of the effects of calcitonin on osteoblasts and investigation of its mechanism. Shanghai Feb J 2004; 27:112-115. Tian WL, Tao TZ, Li L. Study of calcitonin on intracellular Ca2+ and Ca2+ tunnel current flow of rat osteoblast cultured in vitro. Chin J Osteoporosis 2006; 12:262-266. Li XD, Ning C, Zhou Z, Wang GX, Guo YL. Zhuang Jin XuGu decoction improves fracture healing in rats by augmenting the expression of NPY. Int J Pharmacol 2014; 10:175-181. Tian QX, Huang GY, Zhou JL, Liu QH, Du XR. Effects of calcitonin on osteoblast cell proliferation and OPG/RANKL expression: experiment with mouse osteoblasts. ZhonghuaYixueZazhi 2007; 87:1501-1505. Babický A, Pavlík L, Kolár J, Blahos J. Effect of calcitonin on fracture healing in rats. EndocrinolExp 1976; 10:73-79. Wang XJ, Zhou Z, Wang GG, Zhu HZ, Pan YX. Effect and significance of ZJXG decoction on the serum levels of CT and VitD3 in femur fracture rats. Chin Med Pharm 2014; 4:32-34. Komori T, Kishimoto T. Cbfα1 in bone development. CurrOpin Genet Dev 1998; 8: 494-499. Tu QS, Zhang J, James L, Dickson J, Tang J, Yang P, Chen J. Cbfα1/Runx2-deficiency delays bone wound healing and locally delivered Cbfα1/Runx2 promotes bone repair in animal models. Wound Repair Regen 2007; 15:404-412. Adhami MD, Rashid H, Chen HY, Clarke JC, Yang Y, Javed A. Loss of Runx2 in committed osteoblasts impairs postnatal skeletogenesis. J Bone Miner Res 2015; 30: 71-82. Zhang Y, Deng XP, Scheller EL, Kwon TG, Lahann J, Franceschi RT, Krebsbach PH. The effects of Runx2 immobilization on poly (ɛcaprolactone) on osteoblast differentiation of bone marrow stromal cells in vitro. Biomaterials 2010; 31: 3231-3236. Ducy P, Starbuck M, Priemel M, Shen J, Pinero G, Geoffroy V, Amling M, Karsenty G. A Cbfαl dependent genetic pathway controls bone formation beyond embryonic development. Genes Dev 1999; 13:1025-1036. Holm E, Aubin JE, Hunter GK, Beier F, Goldberg HA. Loss of bone sialoprotein leads to impaired endochondral bone development and mineralization. Bone 2014; 10:145-154. Chen HY, Ghori-Javed FY, Rashid H, Adhami MD, Serra R, Gutierrez SE, Javed A. Runx2 regulates endochondral ossification through control of chondrocyte proliferation and differentiation. J Bone Miner Res 2014; 29:2653-2665. Chen HY, Ghori-Javed FY, Rashid H, Serra R, Gutierrez SE, Javed A. Chondrocyte-specific regulatory activity of runx2 is essential for survival and skeletal development. Cells Tissues Organs 2011; 194:161-165. Lee SH, Che XG, Jeong JH, Choi JY, Lee YJ, Lee YH, Bae SC, Lee YM. Runx2 protein stabilizes hypoxia-inducible factor-1α through competition with von Hippel-Lindau protein (pVHL) and stimulates angiogenesis in growth plate hypertrophic chondrocytes. JBC Papers in Press 2012; 287:14760-14771. Perinpanayagam H, Schneider G, Holtman K, Zaharias R, Stanford C. Altered Cbfα1 expression and biomineralization in an osteosarcoma cell line. J Orthop Res 2004; 22:404-410. Zhang X, Yang M, Lin L, Chen P, Ma KT, Zhou CY, Ao YF. Runx2 overexpression enhances osteoblastic differentiation and mineralization in adipose derived stem cells in vitro and in vivo. Calci Tissue Int 2006; 79:169-178. Wang L, Zheng S, Yang FY, Wang LH, Bao JW. Effect of ZhuangjinXugu Decoction on tibial fracture healing: A vertification of core binding factor alpha-1 expression using reverse transcription polymerase chain reaction. J Clin Rehab Tissue Eng Res 2010; 14:3678-3681. Zhu HZ, Zhang MZ, Zhang JD, Zhou Z, Wang GX. The effect and significance of ZJXG decoction on the serum levels of bFGF and TGFβ1 in femur fracture rats. Chin Med Pharm 2014; 4:27-30. Teplyuk NM, Haupt LM, Ling L, Dombrowski C, Mun FK. The osteogenic transcription factor Runx2 regulates components of the fibroblast growth factor/proteoglycan signaling axis in osteoblasts. J Cell Biochem 2009; 107:144-154.